International film star and musician Johnny Depp joined AEROSMITH on stage last night (Wednesday, July 30) at the Forum in Inglewood, California to perform a version of Bull Moose Jackson's "Big Ten Inch Record". 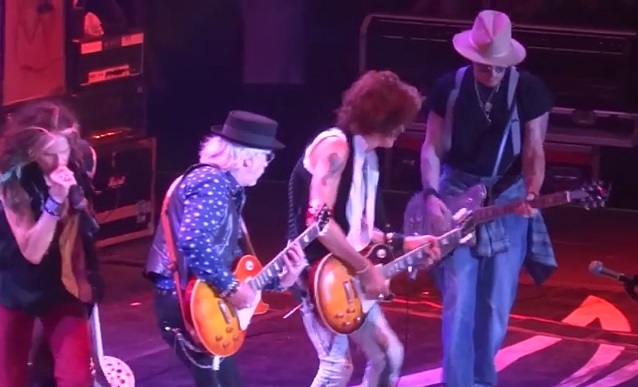 Fan-filmed video footage of Depp's appearance with AEROSMITH can be seen below. Depp appears on AEROSMITH's latest album, "Music From Another Dimension! ", which was released in November 2012. The actor laid down backing vocals on a Joe Perry-penned track called "Freedom Fighter". Perry told ARTISTdirect: "Steven [Tyler, vocals] and I were out in L.A., he was working on 'American Idol', which was basically two days a week. The rest of the time we were in the studio. "It was so inspiring living out there in L.A. and rubbing elbows with so many musicians. Johnny Depp was one of them. I have to rate him as a first-class musician. As great as an actor as he is, he's also right there as a musician. I guess the acting thing outweighed the music thing way back when, but he's a musician through and through." Perry explained how Depp ended up on the song: "Well, I needed a guitar, actually. We'd left a lot of stuff in Boston and he's got a great guitar collection and is a great guitar player, great musician and he was down at the studio a couple of times — so I asked him if I could borrow a couple of his axes. So he brought them down, and as we were laying the tracks down for this song, by the time we finished, it was two in the morning and it was time to do the backing vocals, and usually whoever is left there in the studio will end up doing it. He was there in the studio with some of his buddies, so he ended up doing the 'oh yeah's and stuff. But you can really hear it on the deluxe version of this record. We have the DVD and he sat down and we kept it rolling and he really got a chance to cut loose."